erica lewis lives in San Francisco, where she curated the Canessa Gallery Reading Series. Her work has appeared, or is forthcoming, in P-Queue, New American Writing, Little Red Leaves, Parthenon West Review, BOOG CITY, Shampoo, and Word For/Word, among others. Collaborations with artist Mark Stephen Finein include camera obscura, just out from BlazeVox, and the precipice of jupiter (Queue Books). Stuart Krimko is the author of The Sweetness of Herbert (2009) and Not That Light (2003), both published by Sand Paper Press in Key West, Florida. He is currently translating Daughters of Hegel, a 1982 novella by the Argentinian writer Osvaldo Lamborghini, into English. 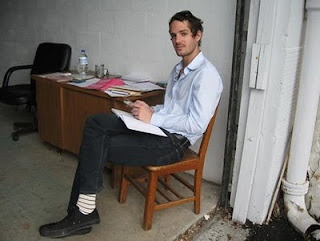 In addition to blogging about miscellany for thethepoetry.com and about wine for Embury Cocktails, Krimko is an Associate Director at David Kordansky Gallery in Los Angeles, where he lives and works.